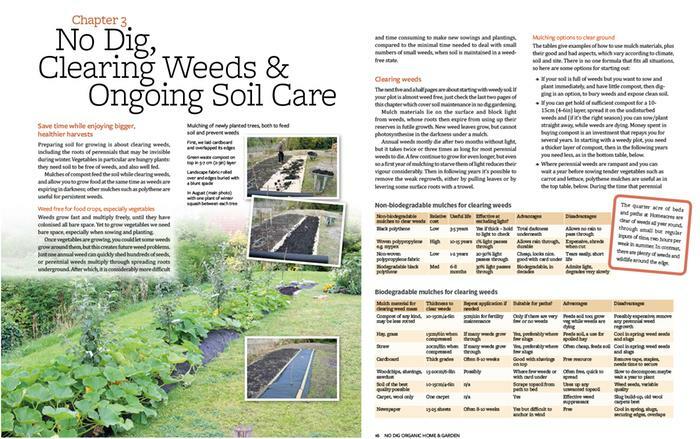 Burra reviews the No Dig Home and Garden and finds an excellent, informative book on no dig organic gardening in perfect harmony with the household too. This is the book on no dig gardening that we have all been waiting for. Not only does it have over 200 pages with all the information you were hoping to find, it is also one of the best presented books I have handled in a long time. The writing is clear with no hype or waffle and is laid out beautifully making full use of the photographs to create an easy to follow instruction guide that you will come back to again and again. The authors have a wealth of experience in various climates and will guide you to the most appropriate techniques to use in your own garden. They also took almost all the photographs themselves, in their own gardens and homes, ensuring that the words and pictures work together in perfect balance and harmony. Here is a sample page to show you what I mean. This book will inspire and enable anyone with a garden or access to enough land to create a no dig organic vegetable garden that will supply abundant produce to their homes. But I think one of the best things about it is that having taught you how to create your garden and grow your produce, it then switches to how to store and use it, not only in the kitchen but all around your home, making this a book that will become a firm favourite that is likely to spend its time living on the kitchen table rather than on the bookshelf. Here's the contents list to give you an idea of the book's scope. As a wonderful guide to tested and proven no-dig techniques it would be the perfect choice for experienced gardeners who wish to broaden their horizons and experiment with the no dig concept. It would also be the right choice for those of us who have physical health problems and want to find ways to continue to raise our own produce without having to dig. But I think the main audience for this book is new gardeners. If I was just setting up my first garden, this is the book I would want by my side. If friends of mine were moving into their first property with a garden, this is the book I would buy for them as a house-warming gift. I can see it becoming my go-to wedding gift. In short, this is a superb book and is as beautiful as it is practical. It an absolute credit to the publishers and authors who have worked together to create a book that is a pleasure to read and a joy to behold. In the time it's taken me to write this review, this book has become the best selling book about organic gardening at amazon.co.uk and it deserves to stay that way for a long time and reach the hands of a whole new generation of budding gardeners. Check out the link above and buy direct at discount from the publishers (P&P free int he UK!). It's the most ethical way of buying books and ensures that small, independent, niche publishers survive in our globalised publishing world. North American readers can buy this title from Chelsea Green Publishing. How to turn your scrap wood and offcuts into high quality BBQ charcoal or make your own artists charcoal from willow or vine prunings. A great guide to foraging in the urban setting with 60 recipes for world foods.